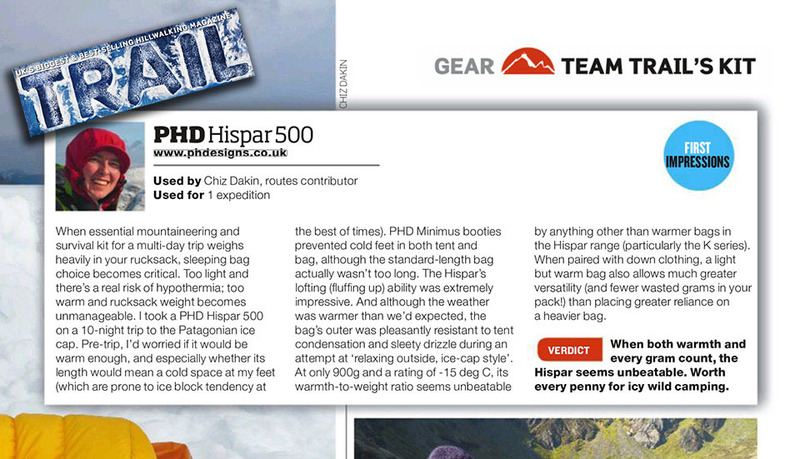 The lightest bag tested yet warmer than some ... the Hispar 500 is my favourite of the bags tested. 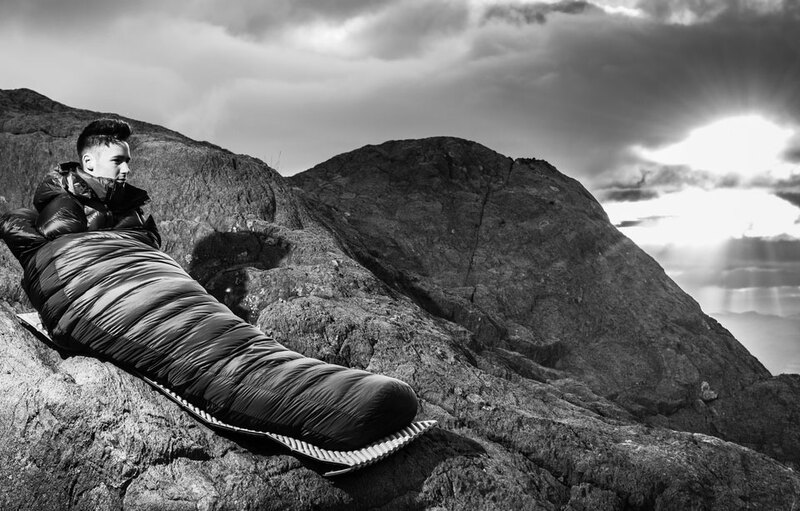 Chris Townsend, Winter Down Sleeping Bags test, TGO Magazine. As used by Jo Meek on the Everest Trail Race. "My Hispar 500 K is awesome, used it first time on Mont Blanc in October this year." "The lightest bag tested yet warmer than some ... The Hispar 500 really does deserve the description 'Ultralight' ... The loft really is astonishing for such a lightweight bag ... the Hispar 500 is my favourite of the bags tested." — Chris Townsend, Winter Down Sleeping Bags test, TGO Magazine. "I took a PHD Hispar 500 on a 10-night trip to the Patagonian ice cap. The Hispar's lofting ability was extremely impressive. The bag's outer was pleasantly resistant to tent condensation and sleety drizzle. At only 900g its warmth-to-weight ratio seems unbeatable. 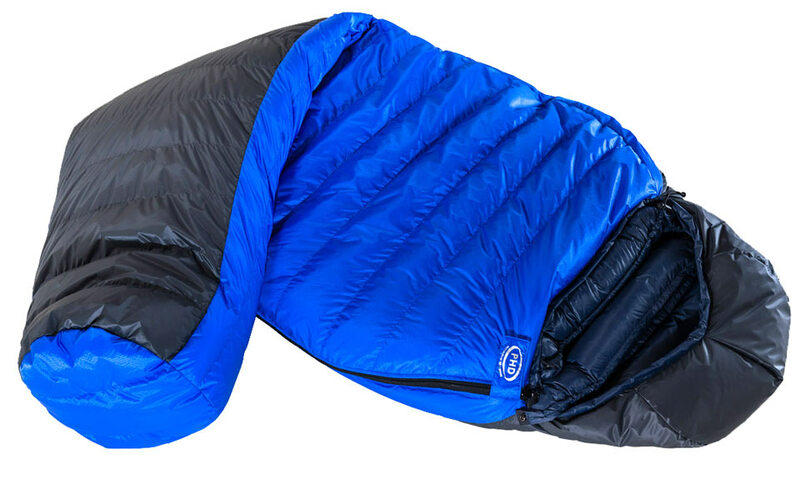 Worth every penny for icy wild camping." — Chiz Dakin, Review in Trail Magazine. 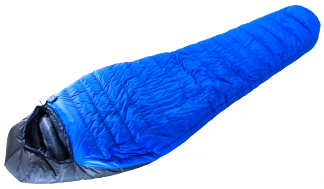 "I used a Hispar 500 Down Sleeping Bag on the Imperial College Reru Valley expedition. The Hispar 500 has an excellent temperature range, and was comfortable both on a glacier at 5700m and at basecamp on the valley. 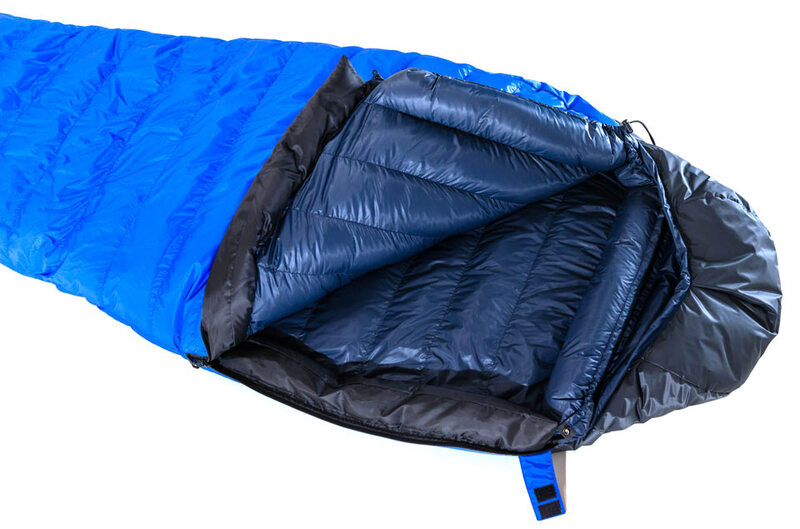 It packed small, was incredibly light and hugely versatile." "The Hispar 500s were very warm, light and packed with relative ease. Even with condensation and freezing on the outer surface of the bag (-20C), very comfortable sleeping temperatures were maintained in the bag." "Thank you for the fantastic equipment. 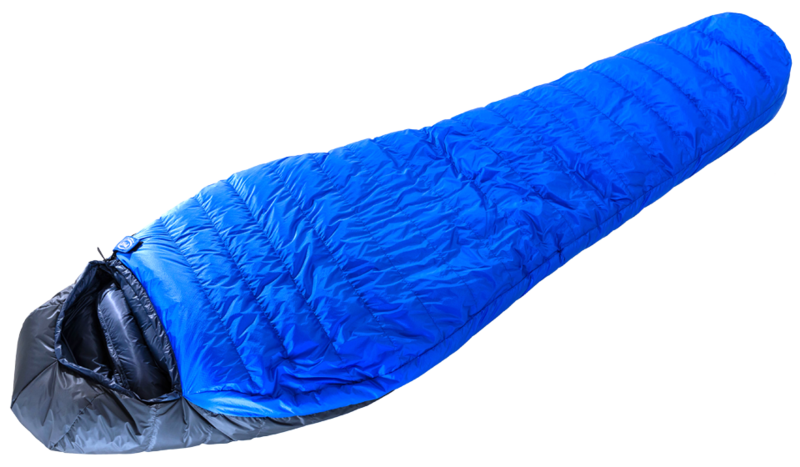 Everything (including the Hispar 500 down sleeping bag) was above and beyond what was required and fended off the elements perfectly." — Graham B, on a trip to Aconcagua. "I'm very pleased with my Hispar 500." "It gives a nice snug fit without being too restrictive. What really impressed me was the amount it lofts, the 1000 down appears to really do its job. Once out of its bag it grows and grows and grows! It's amazing that such a light bag can be so fat. I was sad enough to weigh it with it coming in at 935 grammes with stuff sack, pretty light for a -15 C rated bag with a water resistant shell. I can be an outdoor shop customer from hell inspecting every seam and stitch of everything I buy (usually being pretty unimpressed by the poor construction of kit these days and often finding fault). However so far I have not found even so much as a loose thread."